CHSE +2 result 2018 date and time: This year over 2.84 lakh students had appeared for Odisha 12th class examinations. 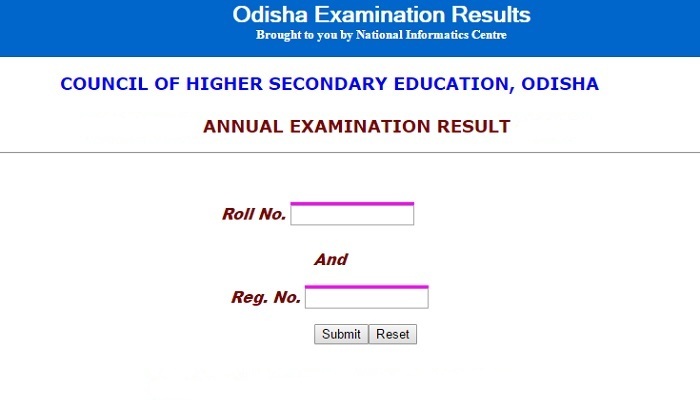 CHSE +2 result 2018 date and time: The Council of Higher Secondary Education (CHSE), Odisha is all set to declare Odisha +2 results for Arts and Commerce streams on June 9 on its official websites – chseodisha.nic.in, orissaresults.nic.in. This year over 2.84 lakh students had appeared for Odisha 12th class examinations that were held in 1,106 centres across the state. The Odisha Board had conducted exams between March 6 and March 29. The development was confirmed by an Odisha Board official which said that the scores will be made available in the presence of state education minister Badri Narayan Patra. “The Odisha Board will announce the results of Plus II Arts, Commerce examination on Saturday, June 9, 2018, at 10:30 am in presence of Education Minister Badri Narayan Patra,” he said. The Council of Higher Secondary Education or CHSE will declare Odisha +2 result on June 9 i.e. Saturday. He also said that results will be out at CHSE’s official websites,chseodisha.nic.in, orissaresults.nic.in from 11 am onwards. The board had declared +2 result in Science in May. The passing percentage was reported at 76.98 percent. This year, again girls did better than boys. Even as passing percentage of girls was 77.98 percent, for boys it was 75.69. As many as 19,561 students got first division, 24,164 students secured second division, and 28,968 students third division. The Odisha Board 12th result will be declared at around 10:30 AM. The timing of the declaration was confirmed by a board official. The result will be declared at chseodisha.nic.in and orissaresults.nic.in. The students can also check the result on indiaresults.com and examresults.net. 2. Once reaching the home page, students can click on the link- CHSE Plus 2 Arts Result 2018 or CHSE Plus 2 Commerce Result 2018. 3. Students are required to enter relevant details and then click on submit button. 4. Results will now be come out on the screen. 5. Now, download results and take out a print out for future use. While regular students appeared in the exam after preparing the new syllabus prepared as per Central Board of Secondary Education (CBSE) pattern, the ex-regular students had appeared for the exam as per their old syllabus. Due to increase in the number of students, the Odisha board, this year raised the number of seats from 1,007 to 1,110 for plus two exam centres.